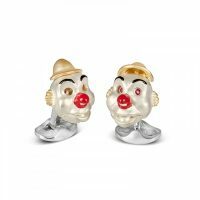 Cufflinks - Connard & Son Ltd.
Sterling Silver and enamel Clown swivel cufflinks by Deakin and Francis, with ruby set eyes which are revealed when the hat is tilted back and its mouth opens. Satinised finish to the face with red enamel nose and gold on silver hat and ears on domed oval spring link fittings. Ideal as quirky presents for the man with everything. Each piece comes in the Luxury Deakin and Francis presentation case. 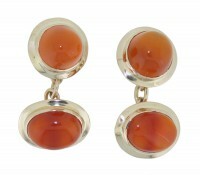 A lovely pair of Cabochon cut Cornelian cufflinks, on each cufflink there is an oval cut stone and circular cut stone, both very well matched to the other cufflink in colour and size. All of the stones are mounted in 18K yellow gold. These Yellow Gold on sterling silver cufflinks are oblong and the front section is curved over from the back. They have a brushed finish with 2 lines grooved in to the front. They have very sturdy swivel fittings attached and are ultimately finished with a rhodium plating to prevent tarnishing. These sterling silver cufflinks are made in a circular barrel shape with a polished finish and inset with yellow gold plate in 3 curving lines. They have very sturdy swivel fittings attached and are ultimately finished with a rhodium plating to prevent tarnishing. These sterling silver cufflinks are made of a brushed triple horizontal bar inset with a line of rose gold plate and a line of blackened finish. They have very sturdy swivel fittings attached and are ultimately finished with a rhodium plating to prevent tarnishing. These sterling silver cufflinks are made of a polished swirling design inset with a yellow gold plated in a matt finish. They have very sturdy swivel fittings attached and are ultimately finished with a rhodium plating to prevent tarnishing.